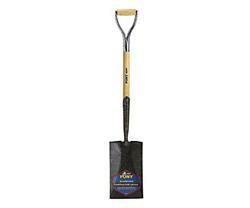 The Jackson J-450 garden spade has a 27 in. L amored high grade northern ash "D" handle for Maximum Strength. Extended blade socket adds strength to handle/socket connection. Smooth black design prevents dirt and mudd build-up.